Formerly known as "Gruppo Improvvisazione Nuova Consonanza" The Group is an ensemble from Rome formed by good musicians from which Ennio Morricone stands out best. 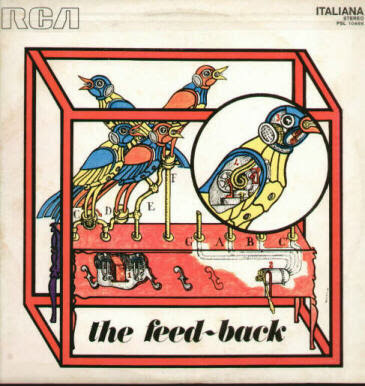 Their musical production is an excellent jazz-rock on the good mainstream of the "Dedalus", "Perigeo" and other Italian bands.This album, called "The Feed-back", is often described by mistake as a classic of avantgarde Italian music just because it has got some resemblances with German production cosmic music, but it's really a very good jazz album with some electronic nuances. The Group featured: Franco Evangelisti (keyboards, percussions), Mario Bertoncini (piano, percussions), Ennio Morricone (trumphet), John Heineman (trombone, piano, cello), Walter Branchi (double-bass), Egisto Macchi (percussions), and some more contributors in several albums and concerts. Feedback: This looks AMAZING! Thanks! Does someone happen to be able to share Il Gruppo D'Improvvisazione Nuova Consonanza - "The private sea of dreams"? Thanks anyway and huge thanks to MS.
for sharin all these musical wonders,you truly are an inspiration. iam starting a blog and have linked to yours i hope you dont mind. and i shall remove it. Shizow! This is rockin' and so different from the other work of Il Grupo...thanks a bunch! If anyone doubts Morricone's virtues [as I have], check out the 2-CD compilation of experimental stuff by him that came out recently... top weird stuff! 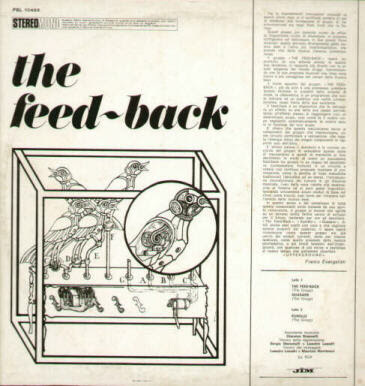 I must say, this Feed-Back album is quite the holy grail discovery! Awesome. I don't agree with the comment that it's basically just a good jazz album beneath the weird mixing and electronic treatment - even if you take away all that, it's still pretty avant-garde jazz, and check out those Can rhythms and funky breakbeats! Reminds me of an experimental jazz version of Joyride - Friendsound. Thanks a million! you five people do such a great job! thank you for using this platform in the most idealistic and dedicated way,i always discover incredible music which maybe would be lost forever without you. wow do you really own this? that record is really really rare, what did you pay for it if you dont mind me asking? Amazing, Ive always wanted to hear this but never had the change to drop on one and Ive never seen it on cd.. thanks for sharing..
Wow. Lucky SOB if you do own an original. That's some real $hit. This is pretty unbelievable stuff. Thanks a million for sharing this gem! does anyone know who the drummer is on this ? thank you thank you thank you thank you coolest record ever. I wonder if 'Niente' is better like they say it is? Can't imagine anything being more slick than this. Such a cool record. Oh man, this has some really hard beats. This must be quite the Holy Grail for hip-hop heads. Thanks for sharing this. God knows how you got a copy. Renzo Restuccia is the drummer. I'm pretty sure Alessandro Alessandroni does the wierd voices too.